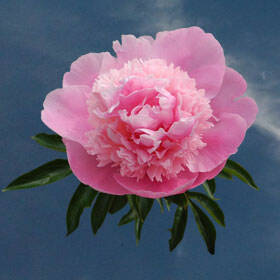 Pink Peonies is a vigorous floret that has been around in floral appreciation for quite some time. Is it any wonder? Coming in hues from light soft pinks to medium tones, this full-headed blossom has a bursting bloom that speaks to our inner desire for prosperity and greatness. In looks, it is excels to the point of being exceptional and has a fragrance of moderate strength. This floret is like an engaging fantasy, It is the blossom of princesses and knights, fairy-tales, chivalry, and honor. Access all your dreams with a brief look at these gorgeous orbs of mental transportation. An unexplainable happiness ensues around Pink Peonies. She has that kind of power. Pink Peonies pairs beautifully with other peonies of varying pinks, creams, and whites for a decadent arrangement that is simply magical and twinkles like stars from globe to globe of clustered petals. Their blossoms are majestic as a lion's mane with layers and layers of petals that flourish and support each other to make one massively impressive being. Soft and plum, consider these full-bodied blooms for an extraordinary wedding arrangement or fanciful birthday party. Express your good-feelings at a baby shower or elevate someone's spirit and give yourself the great pleasure of witnessing the receiver's joy. We have extremely high standards of beauty that must be met by all flowers that we deem worthy of sending to you. Raised and picked by expert florists, we know you'll only be exceptionally pleased with your floral purchase.